I rounded off September's "Behind the Screen" entry with a bit of frustration with plugin issues. A loss of a mouse input on the main screen and only a working menu bar is going to drive you mental if there is no becoming fix. These plugin issues are very annoying and can be really and sometimes impossible to fix... Your thoughts are to just pull out all your plugins and find the offending traitor. Well that was the very first thing I did with no change and that was when it went from maddening to down right just frustrating and after three weeks of pain I was getting a bit bothered about the whole thing and not to say of all the lost time in doing reviews and testing. But I knew and it pointed to that it was still an plugin issue. First point is that it only affected me? As if it was a global issue it would have been all over the forums. Secondly it was the thought that it could be the new X-Enviro v1.07 as it was released at that point in time, thirdly I had run close to 30 betas of WorldTraffic3 and all those plugins were just not talking to each other? You could run one but not both together as they simply hated each other? Then there was the X-PlaneRealistic plugin that became corrupted as it it ran through the FlyWithLua plugin and so the imposter simply ruined that with a "Nil value". And so there is a big thank you to both the developers of FlyWithLua and Roy from X-PlaneRealistic who both put in a lot time trying to find the cause and fix the issue... so how the damn do you fix it? The Nuclear approach involves a complete X-Plane rebuild by downloading a second X-Plane version (or demo version) and rebuilding the simulator up from scratch. The X-Plane basics stay the same in that you move over only your larger folders including your Global Scenery, Custom Scenery and Aircraft folders. The rest is all new and clean, It is like a huge moving house clean out and this cannot be unstated as a bad thing. As you go along adding in hundreds of downloads this and beta that, then a lot of junk can and does build up in all the various folders and worse in different preferences spread away from the main preferences stored in your output folder, It is in the really small stuff that really clogs up the simulator. So a three hour download of Gb's of X-Plane, one hour to reset everything and add in all my settings again and I restarted my ultra clean X-Plane11 and guess what?... the damn issue was still there?... So it was time to get creative? I knew the X-Plane download was clean? and I tested it next with the original demo scenery, default aircraft folder and demo custom scenery folders installed... and the issue finally and thankfully went away? So it was now the Sherlock Holmes approach to elimination in trying each default folder separately then concluded that the issue was in my custom scenery folder... more elimination concluded that any scenery installed in September had to come out and do a retest after retest until I narrowed the villain down to a scenery that I had been given to review, It was a nasty piece of bad problems right from the start, but it also contained a folder with a SASL plugin installed... and there was my master villain... a rogue SASL plugin that consistently conflicted with all the other plugins.... pulled out the offending scenery and my life suddenly went back to normality and my X-Plane simulator suddenly began worked like clockwork again and has done ever since. So if your X-Plane application starts crashing and behaving oddly you can guarantee it will mostly always be a plugin, but the motto of the above story is that it is not always the ones in the actual plugin folder that is causing the issues. I totally recommend to "Nuclear" your X-Plane application at least twice a year and even every quarter if possible and that is even if X-Plane is running perfectly. This house clean is in just that, it is a clean out of all the hidden stuff you can't see. Then to save this current newly downloaded copy of the initial download (before you add in the Global Scenery/Custom/scenery/ Aircraft folders) on an external hard drive for a quicker download of a clean edition in the future, you can then easily run the updater to bring it up to the current X-Plane version. Another bonus is that if X-Plane goes batty or isn't running correctly then that clean version is always there to put everything back running and correctly very quickly. Another version to v2.5 for vSkylabs DC-3 dropped in also in October. This is only after weeks since the last revision of the last release and you were really expecting only a few nips and tucks but not the excellent load of new features on the aircraft... It is absolutely a work in progress, but the aircraft has become one of my go too's if I want to just fly to particularly nowhere at all but end up flying for hours and hours to well particularly nowhere. It is that sort of aircraft in the sheer delight in just rumbling along at a 200mph speed and 6000ft and loving every minute of the experience. You see the aircraft grow before your own eyes and become just better and better, and so its journey becomes your own, it has been one of the aircraft of the year to date. X-Plane11 v11.10 beta hit the download and it was an excellent update. I do admire the way Laminar are getting that efficiency into X-Plane and my framerate did improve around 15-20 frames on average. Laminar are aiming for a 60 frame average and if you had told me that number last year, I would have thought it was some sort of a Halloween prank, but no, now I think it is possible and achievable. Of course disregard the nutters that say that the framerate is worse than ever as they are the ones not checking the defaults in settings or worse not using the same scenery or aircraft to find a cosmic balance... It is good and even great and believe me on that. The G1000 was excellent as it was expected to be. Laminar do create basic versions of these GPS systems without any frills, but they are very solid as well, very impressed.The new Version 3.0 of the X-Plane SDK (XPLM) was very interesting as well. These sort of new additions don't really change anything at their time of release, but certainly the effects will be very quickly realised and then the changes will be huge and have a significant impact on the way we use the simulator. The clever points with tools like these are the ideas that come out of nowhere but then change everything with a new direction of an old way of doing something, so you should be very excited about a simple thing as a new SDK, it can change your world... no pun intended. 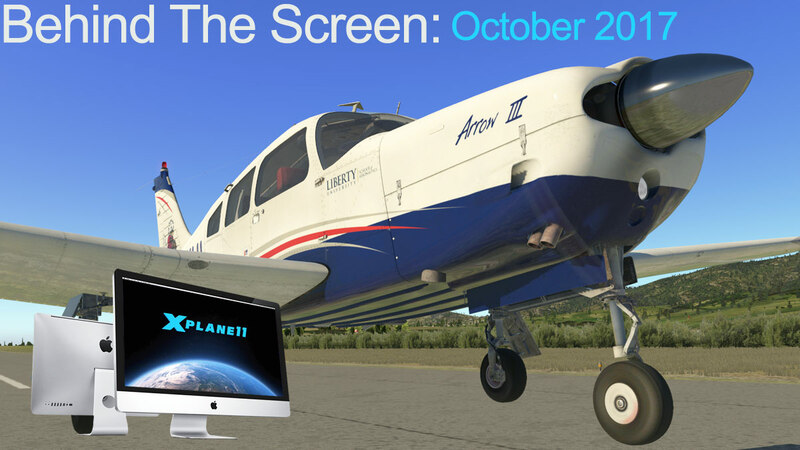 October is always the big month for big new product or final beta testing of aircraft and this year was no different, mostly it is aimed at the coming Thanksgiving/Christmas seasons. This year is slightly different in that there won't be a Laminar Research release... X-Plane11 is now last years highlight, and it will be quiet on that front this year after v11-10 goes final. So the usual late October releases were both very significant aircraft for X-Plane in the Arrow III by JustFlight/Thranda and Airbus A320 Ultimate from FlightFactor. For being very different types of aircraft they both had some remarkable similarities. They both lift simulation another notch up in quality and expand out the sheer breadth and scope of their designs. Outwardly they look very X-Plane familiar, but both aircraft require another level of skill and learning to get down their real depth of the expanded experience that they can deliver. Ask me the same in six months and I will say maybe "oh that, yeah easy" but in reality there is a bit more going on here than that. We do take are simulation flying very seriously (maybe too seriously sometimes) but simulation is getting extremely complex, not in the broad sense but certainly in the details. The Arrow demands a lot of practise and the far more higher skills to fly it. It makes it hard in a review sense in that you want a review up there quickly but also in a very complete form in its analysis and interpretation. But in a few days with aircraft like the Arrow it is very hard to do that because with every flight there is far more to learn and far more absorb, even with a hard flying five flights to understand it, I then get the overall shape, but is certain it will take a far longer period to really be a full master of the machine, that is with a lot of practise and lots of hours flying the aircraft. Ask me again in six months what I think of the Arrow and in some areas I will counterclaim my own review. But that I think is normal as well as you go through the learning process, it is a totally brilliant aircraft is the Arrow III but it also lifts the game a few notches higher as well and with that we have to adjust upwards as well with our newer required skill levels and knowledge on how good aircraft like these are now represented on a computer screen. The A320 Ultimate is exactly the same as the Arrow III. Another huge download file, another huge learning curve and a depth of a simulation that goes deeper than the grand canyon. There is no doubt the A320 Ultimate will be a landmark aircraft for X-Plane, but don't expect that straight away. With this huge step forward there is also a learning path not only for the developers but for us the users as well. Another point on these two aircraft is they are pushing computer power and X-Plane limits as well. A 4gb VRAM graphic card is a requirement for both aircraft, but in reality they both require an 8gb VRAM graphic card to give you the expanded graphic head room to work with, and how quickly did we get to that line and limitation. Yes computer power is still staying close to Moore's Law and still we need more. Thankfully the foundries of Intel and current new kids back on the block with AMD's Vega and Ryzen Threadripper's multi everything will help out the cause, but they are not cheap and you have throw in a new motherboard as well to add in to the next step cost changes. It will cost you as much now as it did with purchasing the whole computer in the first place, and so it better be worth the step cost. And sadly as always many will be left behind or be restricted to certain aspects of online flying. The site will be quiet for about ten days as I head off on a cruise around the South Pacific, "oh lucky you" you will say, but there is sort of madness in the equation. I decided that only a complete disconnection from the internet will relax me, and once 5 miles out into the Tasman Sea and my iPhone connection will then be severed until I come back 8 days later... will I cope, not on your life but I need a break, a rest... so total boredom beckons and a few games of Bingo, I am sure I will have any aviation questions covered... lucky legs 66! See you all again after I get disembarked.